NEW PRODUCT! Adafruit Beginner LED Sewing Kit « Adafruit Industries – Makers, hackers, artists, designers and engineers! 4 x candle flicker LEDs – they twinkle automatically, no need for a microcontroller or external circuit! This kit comes with enough supplies to make two projects with two LEDs each, or one project with four LEDs. Great for embroidery and needlework, light-up jewelry and hair accessories, shoes, plush toys, and more. This is a great beginner kit for kids (no soldering!) and adults alike who are looking to get into soft circuits and wearable electronics. 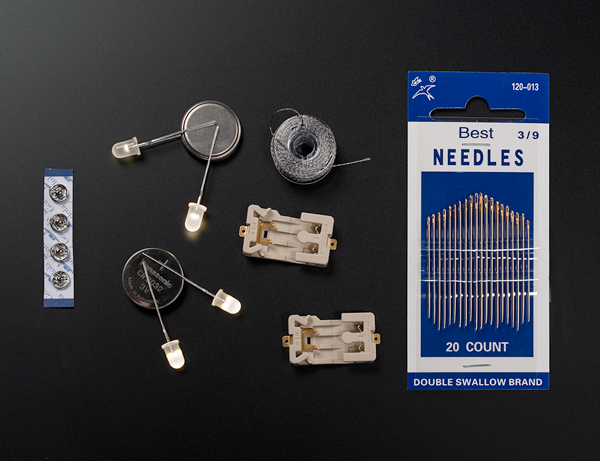 Check out our guide for the LED Sewing Kit on the Adafruit Learning System! Learn to make a Candle Flicker Hairbow with our project tutorial!